While many Egyptians are apprehensive about what 2019 may add to their burdens amid news of a further reduction in fuel subsidies and rumours of a phasing out of electricity subsidies, a series of positive reports on the economy as well as news of a decline in inflation has come as a relief. Standard Chartered, a British-based multinational bank, put Egypt among the world’s 10 largest economies in 2030. The list includes other emerging markets like Turkey and Brazil. The bank based its forecast on the countries’ Gross Domestic Product (GDP) measured by purchasing power parity exchange rates, a mechanism to compare the GDPs of different countries according to the purchasing power of their currencies. With an expected GDP of $8.2 trillion, Egypt is ranked seventh in 2030, ahead of Japan and Germany with $7.2 and $6.9 trillion, respectively. China topped the list, followed by India and the US. “Our long-term growth forecasts are underpinned by one key principle: countries’ share of world GDP should eventually converge with their share of the world’s population, driven by the convergence of per-capita GDP between advanced and emerging economies,” Standard Chartered economists wrote in a note reported by Bloomberg. Egypt’s current GDP is estimated at LE3 trillion, and it has an expected growth rate of 5.8 per cent. The World Bank expects the Egyptian economy to grow in 2019 by 0.2 per cent faster than originally anticipated in 2018. Its most recent publication, the Global Economic Prospects 2019 report, puts growth at 5.9 per cent and six per cent in 2020 and 2021, respectively, thanks to a recovery in the tourism and natural gas sectors coupled with policy reforms, fiscal adjustments and the easing of the country’s unemployment rate. Tourism saw a noticeable recovery during 2018. Revenues from the reviving sector during the first half of the year came in at $4.8 billion, Reuters reported, adding that tourists had increased by 41 per cent to reach around five million, up from 3.6 million during the same period a year earlier. Tourism revenues in 2017 were $7.6 billion, up from around $3.5 billion in 2016. FocusEconomics, a provider of economic analysis and forecasts for 130 countries in Africa, Asia, Europe, and the Americas, was also bullish about the economy. It expected economic growth to be robust during the current fiscal year, putting it at 5.3 per cent “thanks to higher government investment spending, rising natural gas production, and an improving regulatory environment,” it said in a note. Egypt stopped importing liquefied natural gas (LNG) in October, saving the government the LE3 billion it had earmarked annually to meet local demand. This was possible thanks to the output of the Zohr Gas Field, discovered in 2015. With 30 trillion cubic feet (tcf) of gas, Zohr is one of the largest gas fields discovered so far in the Mediterranean. With other new discoveries, roughly two billion cubic feet (bcf)/day of domestically extracted gas can be added to the grid, which means that the next fiscal year will see Egypt having a surplus of 0.5bcf/day versus a deficit of 1.5bcf/day three years ago. As the world’s emerging markets entered the new year with improving performances, hopes are also high that they will gain strength, especially with the possibility of further raises in US interest rates being unlikely. The leading US financial group Citi picked Egypt, together with Kenya and Romania, as the most attractive frontier markets for 2019. Frontier markets are developing economies that are generally considered as emerging markets. Egypt stood out due to its equity market’s low valuations and good earnings momentum as well as its above-average economic growth. According to Naeem Brokerage, a financial firm, Egypt’s stock market indices trade at a noticeable 13 per cent discount regionally and globally. With a price/earnings ratio of 9.6, the EGX30, the main index on the Egyptian bourse, is attractive compared to an average of 11.1 in other emerging markets. Citi has ruled out any significant devaluation in the Egyptian pound, stating that despite the recent surge in inflation it expects currency stability, an opinion that Naeem economists share. “With international reserves touching $42.5 billion, representing more than eight months of import cover, exchange rate stability and healthy foreign currency liquidity is here to stay,” they wrote in a note released this week. The 3.7 per cent decline in annual inflation in December to reach 12 per cent was another piece of good news. Month-on-month inflation came in as negative 3.2 per cent, compared to a negative of 0.8 per cent in November that the Central Bank of Egypt (CBE) had previously said it expected. The drop, the highest monthly decline in almost a decade, was in line with CBE expectations that inflation would be around 13 per cent in the fourth quarter of 2018 before declining to less than 10 per cent in 2019. The prices of food and beverages, which constitutes 40 per cent of the basket of commodities that is used in calculating inflation, decreased by 6.7 per cent in December, thanks to increased supply in recent months. Food and beverage prices had fed the increase in inflation rates throughout the year and during the previous three months. However, the effect of floating petrol prices, planned to take place in June according to Egypt’s agreement with the International Monetary Fund (IMF), will affect inflation, especially if international oil prices increase. Naeem Brokerage has drawn up three scenarios for oil prices and how they could affect the cut in petrol subsidies. 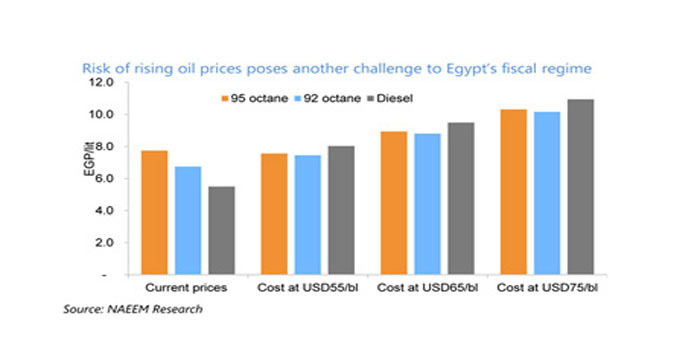 If oil hovers around $55 a barrel, this would mean a 20 per cent increase in petrol prices in Egypt with minimal impacts from the implementation of the fuel indexation mechanism in April on 95 octane fuel which represents a tiny fraction of the total market. If oil averages $65 a barrel, the government will have to implement price hikes amounting to 40 per cent in June 2019. However, if oil rises back to $75, the government will have to engage in much steeper hikes averaging 60 per cent across three fuel categories, according to Naeem. Such increases would trigger a wave of inflation across the board, as has been seen in the last two fuel subsidies cuts. Naeem lists high oil prices together with the inability of the government to raise the required amount of cash to plug the domestic funding gap and weak global investor sentiments that could negatively impact foreign direct investment and portfolio inflows as the three main hurdles that might undermine growth rates. The domestic funding gap is planned to be filled through borrowing from international institutions, targeting international bond markets, or through treasuries. According to Finance Minister Mohamed Maait, talks with the IMF on the delayed $2 billion disbursements of the loan agreement are progressing, and the ministry will come out with a statement soon. The IMF has said that it will wait to see how Egypt implements its new fuel-pricing strategy, announced last week, before committing the disbursement. Maait said earlier this week that he would be visiting Japan, South Korea, Hong Kong and China to study the potential of a bond issue targeting these markets as part of the government’s plan to diversify the currency, the type of asset, and the target markets of its bond issues. The trip will also extend to Europe and selected cities in the US. Investment banks and financial institutions are arranging sit-downs with potential investors to help gauge the appetite for Egyptian debt. The Finance Ministry noted earlier that the cabinet had approved $3-7 billion in foreign bond offers. Egypt raised two billion euros in bonds in April 2018, its first issue in the currency. However, plans to issue more were frozen due to turmoil in the emerging markets, though this has now changed, as has been evidenced by Saudi Arabia, Turkey and the Philippines successfully tapping the international markets with issues of $7 billion, $2 billion and $1.5 billion during the last two weeks. Egypt’s foreign debt stood at $92.64 billion at the end of June. Its borrowing requirement for the repayment of the external debt are $10.51 billion in the current financial year, according to Reuters. The cabinet signed off last week on the finance ministry’s debt-control strategy, which caps Egypt’s Eurobond issuances at $22 billion until the end of 2021-22. The strategy aims at bringing down Egypt’s public debt to 80-85 per cent of GDP by the end of 2021-22 and including the informal economy in the formal economy is part of the strategy. Such a move is expected to increase GDP growth by more than 10 per cent, according to Enterprise. As for Naeem’s third concern of the slowing down of foreign direct investments, which came below target last year, with non-oil investment amounting to just $2.2 billion in the last fiscal year things might be improving. A number of investors have expressed interest in deepening their presence in the market. Manfoods, the owner of the McDonald’s franchise in Egypt, is planning to invest LE250 million in Egypt this year to finance its expansion plans in the country. This includes setting up 13 new branches of the franchise. The World Bank’s International Finance Corporation (IFC) aims to invest $5 billion in Egypt over the next five years. The investments are expected to target the private sector, infrastructure development, and small and medium-sized enterprises. However, the most important investment-related news came from Mercedes. The German car manufacturers said it would soon resume the assembly of passenger cars in Egypt after it had shut down its assembly line in mid-2015 amid foreign-exchange shortages.